#stampinup #faithfulinkspirations I really love this card that we made at the Proverbial Stampers Occasions get together. We're making so many cards, having so many demonstrations, and eating a LOT of good food, that we only have time to make the card fronts. I usually don't assemble the cards until I get home, because I want full-sized cards so I can use them! I also stepped this card up just a little bit from the example. The card uses the sweet "Birthday Bright" set that coordinates with the Birthday Bright Project Kit. 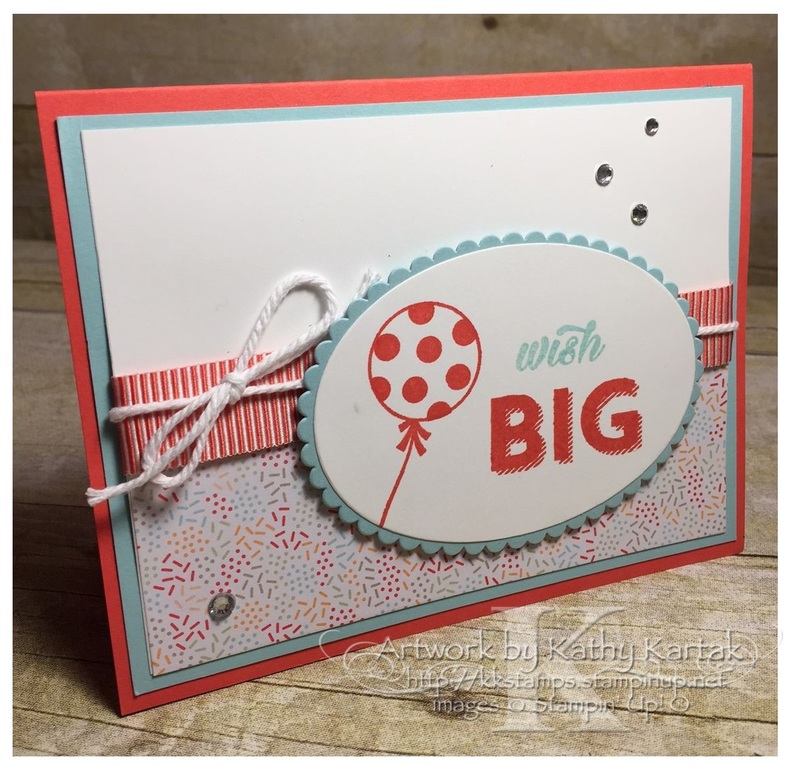 We stamped the balloon, the polka dots inside the balloon, and the "big" sentiment in Watermelon Wonder onto a Whisper White oval that was cut with the Layering Ovals Framelits Dies. "Wish" is stamped in Pool Party Ink. When I got home, I cut a Pool Party scalloped oval to layer behind. I think that makes for a more polished design. The card base is Watermelon Wonder Card Stock, with a Pool Party mat. We added a strip of Tasty Treats Specialty Designer Series Paper to the bottom of the Whisper White Layer, and wrapped a length of 5/8" Mini Striped Watermelon Wonder Ribbon and a length of Whisper White Thick Baker's Twine around the center before adhering this to the card base. I adhered the oval to the card using Stampin' Dimensionals and finished the card with some Basic Rhinestones Embellishments. So cute!